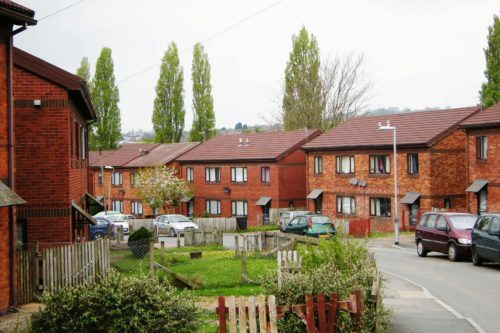 Walpole Close is located in Exeter, Devon and features terraced houses, the majority of which are part of Exeter City Council’s housing stock. Each of these homes shared a common feature that needed replacement – eave to ridge metal sheet roofing. Although comparisons have been drawn between this kind of product and Metrotile Lightweight Steel Roofing, ridge to eaves sheet roofing is actually a less durable product that lacks many of the benefits that a Metrotile rooftop can provide. improve the insulation at the properties by choosing Metrotile for the installation. The rapid installation enabled by Metrotile’s lightweight design allowed Davey Roofing to install approximately 200 Metrotile Bond profiles to each of the 25 homes in the close, breathing a new lease of life into each home with new roofs backed by an industry-leading 40 year weatherproof guarantee. For further information about Metrotile Lightweight Roofing, visit our contact page.To download from our library of informative documentation and certifications, click here.